Microsoft launched their new Product Project Server 2013 in two distinct versions. We have a Project Server 2013 option, where the server is running on local application servers or hosted by third party suppliers. This is cheaper than the 2010 version because it now has only 1 dedicated database instead of 4. And the second option, closely linked to Office365, is called ProjectOnline. ProjectOnline is marketed as a completely new way to look at servers and gives the client the option to seriousy downsize their technical maintenance staff because Microsoft itself hosts the servers. Scenario 1: Lets say the year is 2020, and your company bought Project Server 2013 a long time ago. Please, for the love of your Projectmanagers, start upgrading that old stuff! You will need to do a migration to new servers and that takes time, money and expertice. Please call JSR if you are in The Netherlands, I would love to help you out in the year 2020. Scenario 2: Lets say it is still 2020 and your company took a different route and purchaced ProjectOnline in 2013. You surely would not recodnise the product you see in the year 2020 comparred to the version in 2013. But it is still the same product! There will be no upgrades neccesary and there will be no migrations needed. Still, could you please call JSR in the year 2020? We would love to chat about ProjectOnline and how you can expand the product use in your company. The product has a lot to offer and you probably don’t use all its splendor, yet. Oké now here is the big game changer for Microsoft and it’s clients. Project Server is a big and complicated piece of code. And because of this, it needs updating, patching and hotfixing every now and again. This is what CU’s and Service Packs are for in the “company owned” version of Project Server 2013. The CU in March 2013 was a whopping 1,7 GB big I believe! With ProjectOnline you will not be prompted to install CU’s or switch to a new service pack. The ProjectOnline product is constantly up to date, constantly improving. It is my believe that updates currently active in ProjectOnline will eventually find their way in a Project Server CU or service pack. But if you are a ProjectOnline owner, let me introduce you to two great features that have been added this last month, you may have missed them because they are small but awesome! These 3 little dots start showing up everywhere. They reprisent a submenu in Microsoft products from a very early stage. With the introduction of SharePoint 2013 the Ellipsis is featured in doclibs and all kinds of item specific editing. Now what’s behind door number 3? A submenu that show’s overal progress and gives us the ProjectSite link back! We have missed you projectsite link, welcome back! Now when we click on that ProjectSite link in our new Ellipsis we get a nice ProjectSite. The ProjectOnline version has a new link on the left navigation bar. It’s called “Projects” and brings you back to the projects page where you were before! That is great because before this update you needed to do all kinds of tricks to get back to the PWA site. 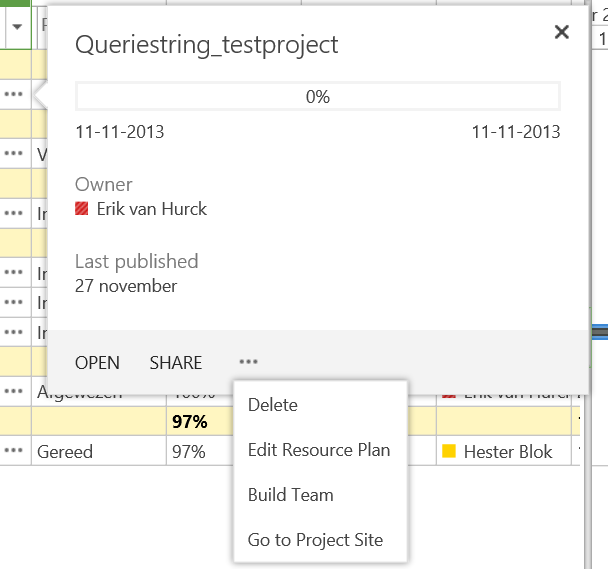 Now you just click Projects and you’re back to do other awsome Project management stuff! I need to be completely honnest with you, sometimes Microsoft does a tweak that goes wrong. You may have heard about the company administrator bug currently plagueing the ProjectOnline tennents. It’s a good thing there is a support team at Microsoft working around the clock to adress issues. So if you are experiencing any issue: log it to Microsoft support! And after that, visit the TechNet blogs or “Bing” to get some answers from the internet. Due to the product’s iterative nature, I will be doing more posts about ProjectOnline in the future. Please let me know if you have found a nice little feature appair on your tennent and I’ll try to make a post that includes it.